A team of Narcotic and Affairs of Border (NAB) of Manipur police department led by an Additional SP arrested two persons for possession of contraband substances. The two miscreants identified as Hidangmayum Inao Sharma (43) and Hijam Tondum Singh (37) were nabbed from Yairipok Yambem Makha leikai of Nagaram area near Punya Hyundai Car Showroom under Imphal East district from at around 5.30 pm on Monday for illegal possession of one kilogram of heroin powder. 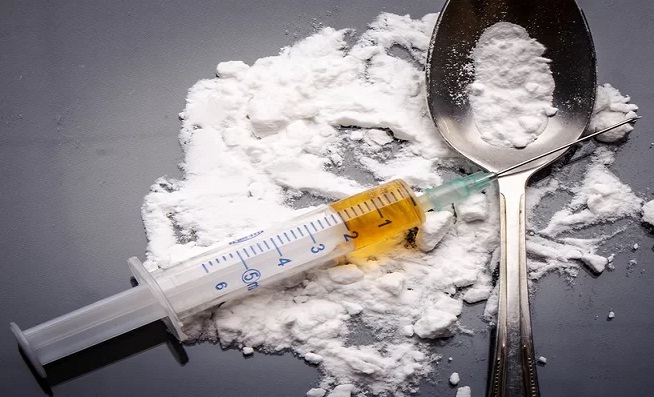 “Accordingly one kilogram of heroin powder and other incriminating documents were also seized from the possession,” said SP W Basu Singh of NAB Manipur police department. In one of the biggest drug hauls by NAB of Manipur Police, 4.595 kg of contraband heroin and 2.80 lakh banned drugs called World is Yours (WY) Amphetamine tablets worth more than Rs 27.79 crore in the international market were seized from eight persons including chairman of Chandel district Autonomous District Council during a night-long operation in and around capital Imphal in the first week of June 2018. Indian currency totaling Rs 57.18 lakh, including Rs 95,000 in old currency notes, was also seized from them during the operation. Interestingly on April 2 earlier this year, the personnel of 12 Assam Rifles seized Rs 16 crore worth WY tablets weighing around 38.52 kg and numbering approximately around 3,20,000 in 1600 packets from a person travelling on a bus in Manipur’s Tengnoupal district when they checked the bus at Khudengthabi check post, along Imphal-Moreh road.